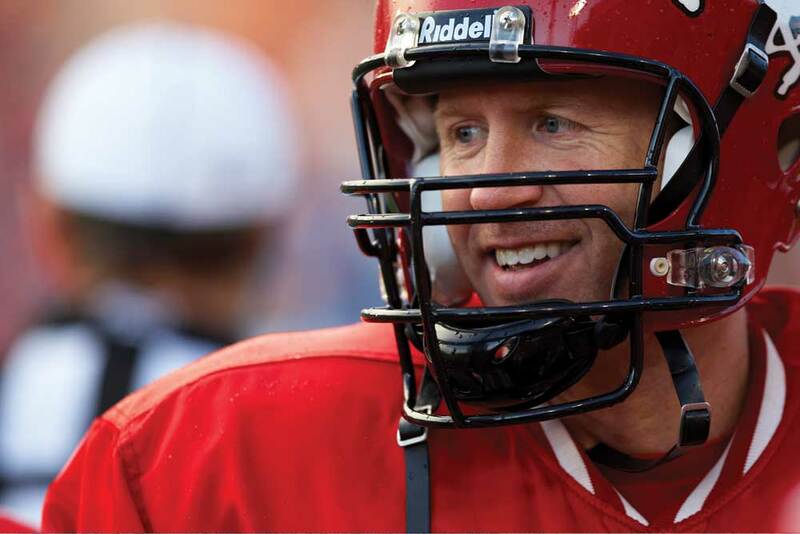 Calgary Stampeders quarterback Dave Dickenson smiles during a 2008 preseason game. He went on to a hall-of-fame career in the Canadian Football League. Imagine if Mount Sentinel above the University of Montana campus was turned into a Mount Rushmore of honorary Missoulians. Who would be on it? Votes would surely go to the pioneering men and women who shaped Missoula’s values and culture, like U.S. Representative Jeannette Rankin, Bitterroot Salish Chief Charlo, smokejumper pilot Bob Johnson and writer Norman Maclean. But the most votes might go to a man who in the mid-1990s wore a sepia-toned number 15 and did for Grizzly sports what no one had done before. He is quarterback Dave Dickenson. In 1995, he led a corps of Montana athletes, like a reverse of the westering pioneers of yore, east from the sparkling Rocky Mountains down to the humid banks of the roiling, brown Ohio River in Huntington, West Virginia, for a national championship game. The Grizzlies had never won it before. A fervent cadre of fans from Missoula followed – forebearers of a culture that would blossom in the next generation. The tale is Grizzly mythology now. On a fourth down on the 50-yard line with his team down 20 to 19 and 3:14 left to play, Dickenson took a snap. With the special intuition that allowed him to throw a record-setting 5,676 yards and 51 touchdowns that season, he waited. Waited as three boulder-sized linebackers charged him after he had already taken a beating all game. Waited until a bullet’s path opened up to fire the ball into the hands of UM receiver Mike Erhardt, who ran it more than 20 yards. The national championship was Dickenson’s greatest achievement in America. After college he went north and became a superstar in the Canadian Football League. That feat briefly brought him back to America for a chance at the NFL. That, however, became his greatest disappointment. Then in January of this year, Dickenson learned that his American career had been dramatically reconsidered on the national level. He was selected for the most elite prestige he is eligible for in his home country. He was voted into the College Football Hall of Fame. It’s a distinction that for him carries extra meaning and made him think about where he might do next. His size masked a fierce competitiveness. It showed itself in everything from his collection of bowling trophies to his 4.0 GPA. His neighbor, Tony Arntson, who went on to quarterback for the Grizzlies and was a role model for Dickenson, took early note of this spirit. In his final years of high school, Dickenson led the Charles M. Russell team to back-to-back state AA football championships. In 1993, he became UM’s starting quarterback despite his weight barely doubling since junior high. “I wanted to go to the top level in Montana and see if I could make it,” he says. At UM, Dickenson was paired with the perfect coach in Don Read. 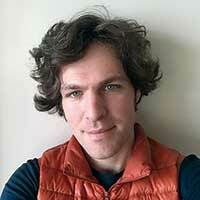 Read recognized Dickenson compensated for strength with smarts and skill. He could decipher in a flash everything an opposing team would do. Lacking a rocket launcher for an arm, this David made his a Goliath-killing sling. On the field he fearlessly dodged tacklers until he could bullseye one of his receivers. 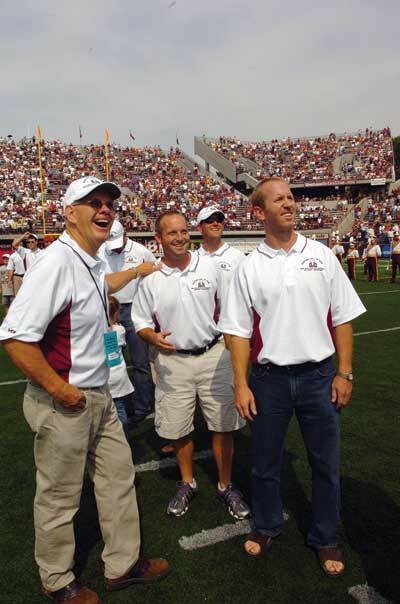 Jon Kasper ’97, who got to know Dickenson as a high school teammate, as a sportswriter for the Missoulian newspaper and later as an assistant commissioner for the Big Sky Conference, says that from the start Dickenson’s perception of plays was superhuman. In 1993, the Grizzlies won the Big Sky Championship for the first time since 1982 and for only the fourth time in history. The next year they reached the I-AA playoff semifinals for only the second time in history. Then came that fabled 1995 season. Super Dave became the most famous man in Montana. To legions of fans, he still is. The national championship made Dickenson, who graduated with a 3.9 GPA, decide against becoming a doctor and instead pursue a career in football. 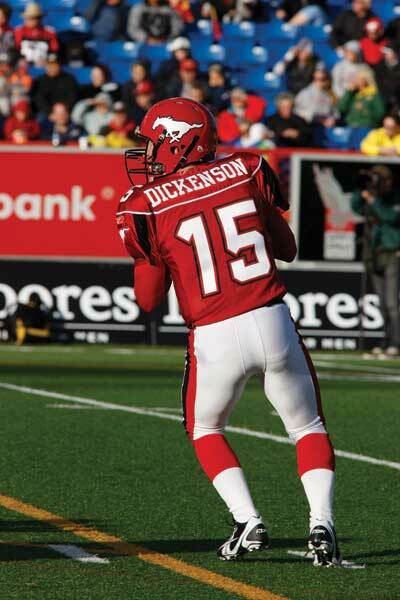 Playing for the Calgary Stampeders in 2000, Dickenson won the Canadian Football League’s Most Outstanding Player Award. That led him in 2001 to the opportunity of his dreams: to come home to America and play in the NFL. Dickenson, then 28, wanted to do what he had done in every other football program he touched. Up to that point, he had not only bested all expectations, he had obliterated them. This weighed on his mind. He never got his chance. He was picked up and then dropped by four NFL teams over two years. 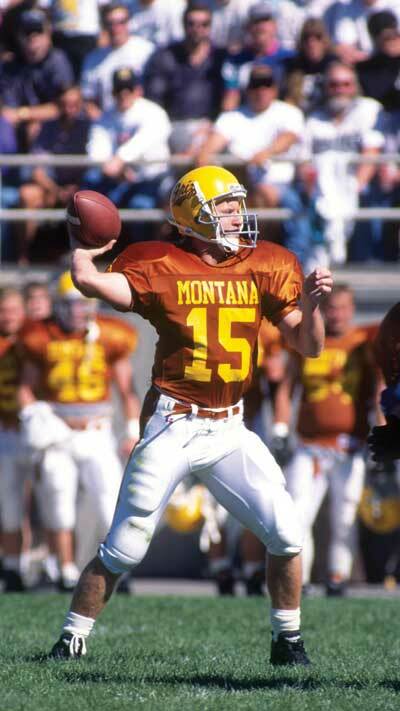 Montana’s greatest quarterback played well in exhibition games only to never get to play a single second in the regular season. It burned him then. It burns him now. He says he felt bitter about the way he was treated in the NFL. In 2003, he went back north. He signed with the British Columbia Lions and in 2006 led them to win the Grey Cup, Canada’s Super Bowl. By 2008, Dickenson’s trademark talent for holding onto the ball until a receiver opened, even if it cost him a skull-rattling hit, became a liability. Though he was by then the CFL’s all-time leader in passing efficiency, he retired because he suffered too many concussions. That fact has left the former medical student worried, but regretful of nothing. "I would do it all again,” he says. No sooner had he hung up his uniform than he was hired as a coach. 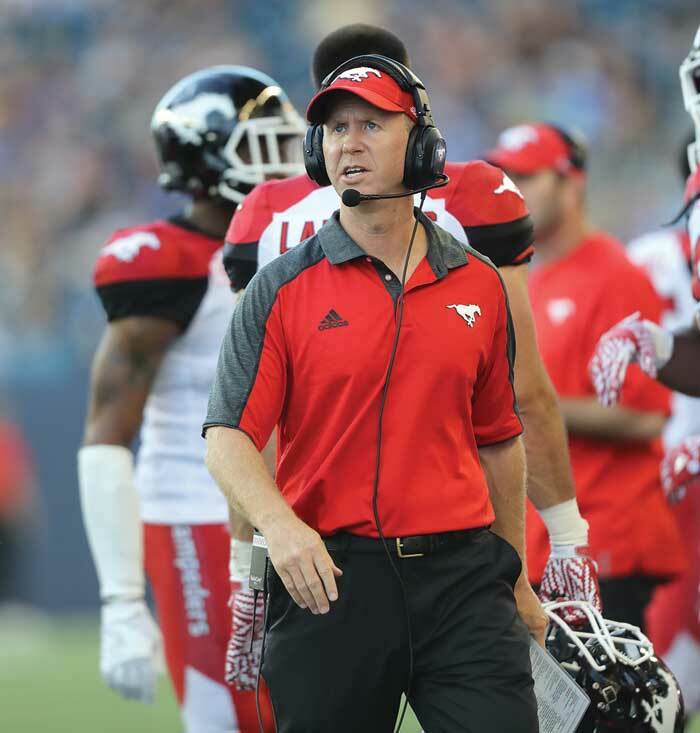 The Stampeders brought him on as their offensive coordinator in 2011. In 2016, he was given the job of head coach. He immediately won the Coach of the Year Award. Halls of fame and other elite merits have come his way. In 2002, he was inducted into the Grizzly Sports Hall of Fame. In 2013, the Big Sky Conference named him its greatest male athlete. In 2015, he joined the Canadian Football Hall of Fame. The only other Montanan ever inducted into the national hall is UM’s “Wild” Bill Kelly ’26, a quarterback and talented open-field runner. Kelly played in the young NFL from 1927 to 1930, but he tragically collapsed and died suddenly while watching a football game in New York at the age of 26. The drive to get Dickenson to the hall began with his brother Craig. Craig Dickenson, now a special-teams coach for the Saskatchewan Roughriders, calls his brother Dave “as good as there was in his day.” He felt that after the NFL disillusionment, his brother deserved a nationwide honor in his home country. “The acknowledgement of making the College Football Hall of Fame validates what he did in the U.S.,” Craig Dickenson says. In 2015, Craig Dickenson called Dave Guffey, then UM’s sports information director. Guffey submitted a formal application to the College Football Hall of Fame. Three years later, Dickenson was voted in. Dickenson’s wife and two children, his parents and his siblings will travel to New York City in early December for the induction ceremony. Dickenson says he is once again proud to have brought esteem to his family name. His sister Amy pointed out that all Dickensons played a part. “But let me say I know the Griz are in good hands right now with Bobby (Hauck),” Dickenson says. “He’s a great coach, and I’m excited to see what he can accomplish this year. And I’m certainly not in a hurry to leave Calgary, but I do always have Griz football on my mind. Craig Dickenson says that, ironically, his brother, always protective of his family time, created the conditions that make him hesitate. In the past generation, Griz coaching has shifted beyond intensive cultivation of native-grown alchemy to include time-intensive recruiting of top talent from far away. Dickenson knows that if he didn’t do as a coach what he did as a quarterback, it would never tarnish his playing legacy. But it would become its epilogue. Fortunately for the Griz fans who would love to see his face above the stadium, or better yet back in it, he never let fear stop him from a play. He continues to wait for that opening.